Open to every reader; you do not have to be in a book club to attend this event. **Register your Book Club for NovelNetwork now or at the event (it’s free) and your members qualify for the Book Club Bingo discount. And each member of a registered NovelNetwork book club who attends the event will receive a free custom-designed book bag! Adventures by the Book®, together with the Library Shop*, a non-profit gift shop supporting the San Diego Public Library, are pleased to invite you to San Diego’s biggest and most exciting book club extravaganza of 2018, our inaugural Book Club Bingo Adventure, featuring New York Times and international bestselling author Jenna Blum, together with at least 18 other amazing and talented popular book club authors, like Juliet Blackwell, Patricia Bracewell, Janelle Brown, Matt Coyle, Laura Dave, Kathi Diamant, Amy Mason Doan, Loretta Ellsworth, Liz Fenton, Janna King, Susan Meissner, Kitty Morse, Robin Oliveira, Kate Quinn, Kristin Rockaway, Marivi Soliven, Abbi Waxman, and J. Dylan Yates. NOTE: You do NOT have to belong to a book club to attend the festivities. All readers are welcome! One of Oprah’s Top 30 Women Writers, Jenna Blum is the New York Times and international bestselling author of Those Who Save Us and The Stormchasersand the novella The Lucky One. She has taught novel workshops for 20 years at the famed Grub Street Writers in Boston, where she earned her M.A. at Boston University. In addition to interviewing Holocaust survivors for the Shoah Foundation, Jenna is a public speaker and avid cook and tests all the recipes in her novels. In her new novel, The Lost Family, this dynamic storyteller returns with an immersive, emotionally riveting family saga about the reverberations of World War II across generations. 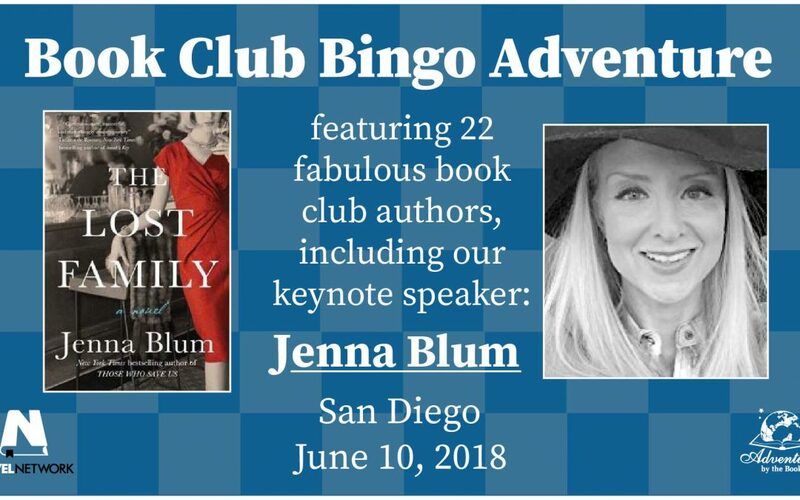 Book Club Bingo Adventure Featuring New York Times and International Bestselling Author Jenna Blum, and at Least 18 Other Fabulous Authors.